Yes, I know – not a pleasant thought. But that’s the problem with our air conditioners, we don’t like to think about them until we absolutely have to. And by that point, it’s more emergent because we just need it work during these hot summer months! If you’ve never had problems with your home cooling, then you’re probably thinking why bother? Well glad to hear there are no issues, but chances are it isn’t going to stay like that for years to come. Keeping up your regular maintenance with your air conditioner will help you keep your unit running in better shape for its lifespan. If you’ve lived in your home for a few years now and you’re noticing a distinct difference in your home’s cooling ability from last year, then that’s a clear sign that there is something going on with your AC unit. This could be a minor or major problem depending on where the cooling issue is coming from. Not only are those strange noises irritating to your home life – they’re likely a heads up from your unit that something is not right. Your technician will be able to determine what the noise is connected to and inform you of your issue’s extensiveness. Refrigerant leaks are not every fun to deal with, but not uncommon when it comes to dealing with your air conditioner. Your technician will be able to identify where the leak is coming from and be able to repair it. Depending on how bad the leak is, he/she may inform you that it might be time for repair. So how do I tell if it’s a minor or a major problem? Minor problems such as loose ductwork aren’t going to prevent your unit from working properly long term. But they can lead to major problems down the road if they aren’t taken care of. Something as simple as remembering to change the filters or getting that leak looked at will help keep your unit clean and help you reduce your need for repair. But you’re in luck! 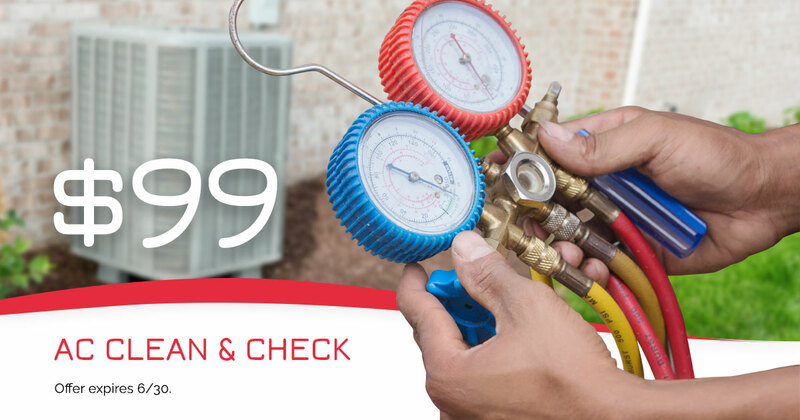 Through the month of June we are doing AC Clean and Checks – for only $99! Our friendly technicians will help get your AC unit ready for the hot summer months ahead. Type 63828 and click "Submit"
Type 95774 and click "Submit"